. Published on Wednesday, June 27, 2018 . While the academic year was wrapping up, we were also completing our #RechargeCPP campaign. 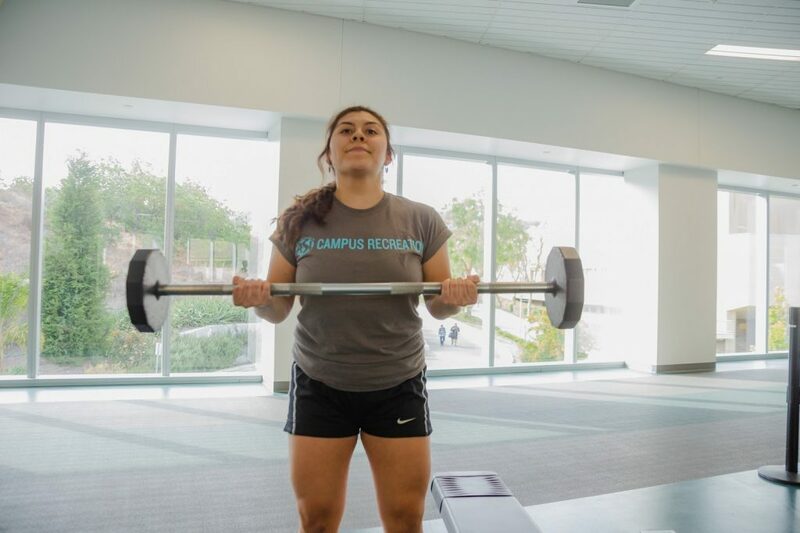 We have highlighted Cal Poly Pomona (CPP) students who are active at the Bronco Recreation and Intramural Complex (BRIC, Bldg. 42) in our Adventures and Aquatics departments, and for our final installment, we have selected a student who has experience with our Fitness and Sport Clubs departments, and who chooses to recharge by using the BRIC facilities during her free time. Nataly Arellano Rodriguez is a fourth-year food and nutrition student with an emphasis in dietetics and a minor in physiology who has a true passion for the BRIC and all that the facility has to offer its members. Arellano Rodriguez started working for Associated Students Inc. (ASI) Campus Recreation during her first year as an Intramural (IM) Sports official, and she now holds three positions at the BRIC: Sport Clubs supervisor, personal trainer and group fitness instructor. In addition to her various roles at the BRIC, she also works out using the facility and plays IM Sports every quarter. With three positions at the BRIC, a full course load and being an active member of her sorority, Arellano Rodriguez recognizes the importance of taking the time to recharge, which she does during her time off at the BRIC. “I think that ‘recharge’ means going back to home inside of you and finding your way to find that motivation inside of you,” Arellano Rodriguez explained. While that concludes our student highlights for our #RechargeCPP campaign, we still want to hear from you, Broncos! If you have used the BRIC facilities to recharge amidst your busy schedule, share with us by using #RechargeCPP on Campus Rec’s Twitter, Facebook and Instagram pages.